The MetaTrader 4 platform, given its software power, naturally offers ways to avoid mouse-clicking in order to execute each command. This can be done by either using the Fast Navigation Box, or, just like the operating system on your home PC, by pressing hot keys or hot key combinations. 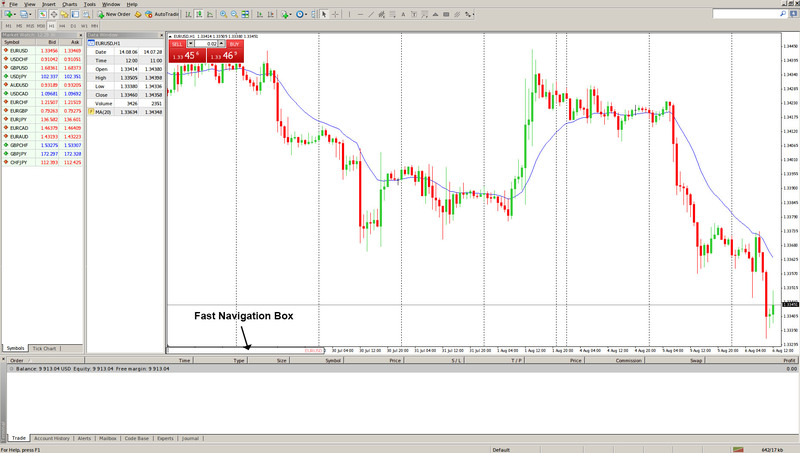 The fast navigation box is used for quick switching between charts and between chart periods, as well as to quickly scroll the chart to a selected date. The box can be brought up either by hitting the Enter key on the keyboard, or by scrolling to the lower left corner of the chart and double-clicking the left mouse button. Here is where the box appears in the platform. There are six types of commands that can be executed through the fast navigation box. – Switch the security being displayed. This is done by typing its symbol, for example USDCAD or EURUSD. – Switch both the security and time frame by writing the symbol and the chart period, separating them with a comma, e.g. USDCAD, H1 or EURUSD, D1. – Jump to a specific time. This is done by writing the exact minute which you want to jump to, e.g. 09:30. Note that the first 0 can be skipped, thus you can write only 9:30. – Jump to a specific date, by writing the date in the format of DD.MM.YYYY, DD.MM.YY or YYYY.MM.DD. Note that the YY.MM.DD format is not supported. – Jump to a specific time and date. This is done by using the formats from the two points above, with time always being behind the date, e.g. 15.07.2012 09:30. Just like your operating system, MetaTrader 4 also allows hot keys to be used in order to speed up operating the terminal. Here is the complete list. – Ctrl+F9 opens the “Terminal Trade” window and switches the focus to it. After this, the trading activities can be managed with keyboard.